Our latest app updates are here, bringing some valuable enhancements to your video monitoring experience. Update your iOS or Android app today, and you'll find it easier to see what's happening with your smart security cameras—plus, you'll never miss a visitor again. 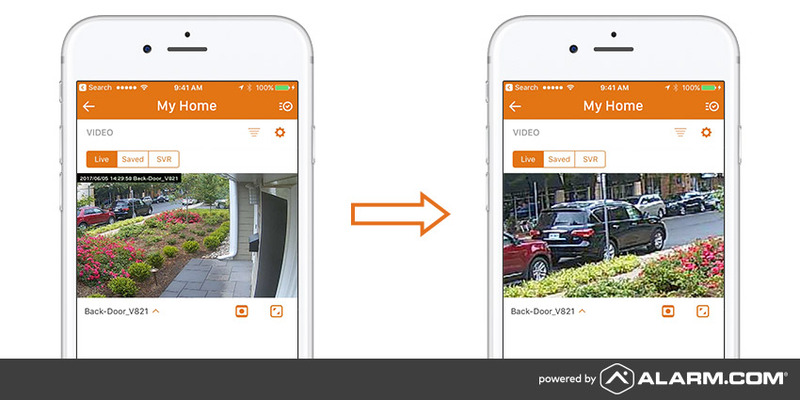 Sharing an Alarm.com video clip is now as easy as sharing a photo. 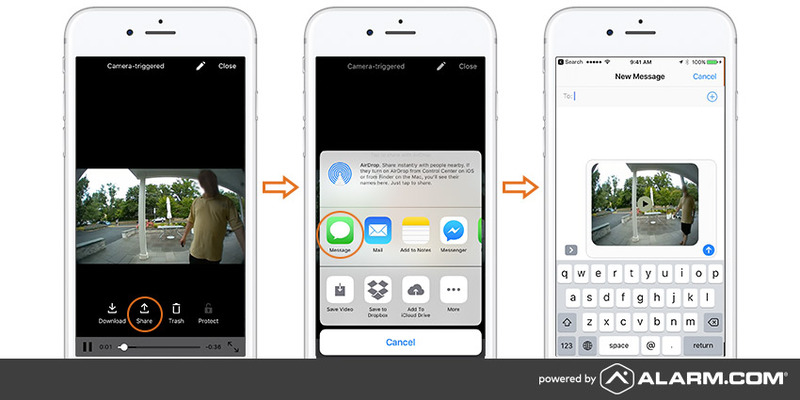 When you watch a recorded clip, you'll see a new set of icons at the bottom of the screen, including a Share button that lets you share the clip via message, email or social media. Whether you need to quickly forward a clip of a suspicious caller to your local police department or neighborhood watch group, or you want to upload a clip of your toddler playing to your Facebook timeline, you'll find it a seamless and intuitive experience. Did you hear a noise outside your house and want to see what's going on? Are you at work and wondering what your kids are watching on TV? Just open your outdoor camera's video feed, then use your fingertips to zoom in anywhere on the picture for a better view of what's happening. Have you ever missed a live Doorbell Camera notification on your phone because you were busy, and thought it was just a text? The push notification sent when someone rings the Doorbell now uses a special doorbell chime instead of the default notification sound. Android users can now take advantage of Android Shortcuts to interact with their homes more quickly. If you're running Android 7.1 and up, you'll be able to set up a set of quick commands, activated via a long-touch on your home screen's Alarm.com icon. Related stories: did you miss these updates? As the leading platform for the connected home, we're always working to improve your Alarm.com experience with new features and enhancements, delivered at no extra charge. To keep up with the latest news from Alarm.com, follow us on Facebook and Twitter.